Bitul is the spiritual state associated with the inner experience of chochmah, whereby one’s consciousness opens up to a continuous flow of Divine wisdom and new insight through one’s nullifying his sense of autonomous and self-sustained being. Bitul is the experience of ayin, of being nothing within the omnipresent radiance of God’s infinite light. Bittul ha’metziut means “nullification of existence”… [it] occurs when a person experiences no sense of separate identity or subjective independent existence. The individual has been elevated permanently to a higher level of awareness in which he or she experiences absolute oneness with G-d.
Bittul ha’yesh involves releasing the static “there is” way of conceptualizing existence, which results in an annihilation of the egoic self, as well as desires rooted solely in the lower aspects of personality. And so we see these two sides, Shapiro (and perhaps Rohr) on the one hand saying that “self” is not dissolved but realizes the fullness of God within itself, but others noting that there is a complete nullification/annihilation of any sense of a subjective separate egoic self. This idea of the ego falling away seems to be strikingly consistent across cultures and religions. 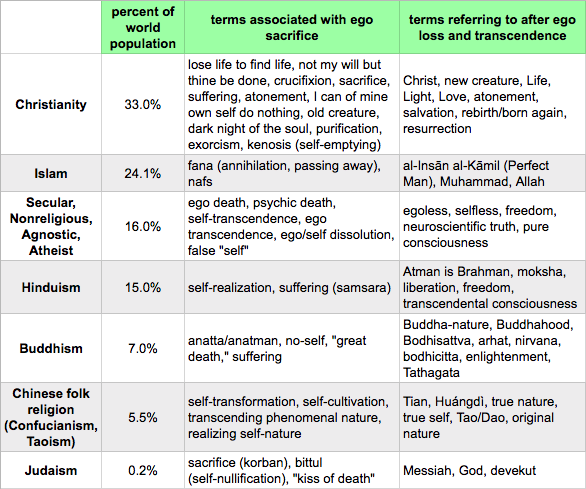 In Buddhism it seems to be quite similar to realizing anatta, or anatman, the “no-self.” In Christianity we might see it in the concept of kenosis, or “self-emptying.” In Islam (Sufism) it may be fana, or “annihilation of self.” Here are some related ideas in the various religious and secular traditions. How does one experience the nullification, negation, dissolution, emptying, annihilation of the ego-self, and yet still have a sense of self afterwards? I think it may consist of having a glimpse of reality without “you” in it. Your individual sense of “self” entirely disappears from consciousness for a moment, or for a time however long, and you perceive reality as an undifferentiated, undivided, inseparable, continuous, interdependent, pure unity of all things in One. You see that the separate “self” that you think you are arises in the mind just as all other things, forms, matter, ideas, concepts arise in the mind. What you think of as your “self” is realized as no different than any other thought in the mind. It can arise, and it can pass away. Consciousness does not depend on a sense of “self,” but rather the sense of a separate “self” arises within consciousness, as a process of consciousness. You realize that your deeper essence or identity goes far deeper and far beyond the sense of an ego “self” to include all things, all beings, all persons, all of life, all of creation, the whole universe in One Great Whole. But then the ego “self” is reborn, resurrected, reincarnated, brought back online in consciousness. Your ego “self” reappears, is born again. “You” are brought back to Life, to existence, but you have seen beyond your “self” to the unity of all things, the source of all things including your conscious sense of “self,” and this source is One. You come to know your ego “self” as a manifestation of the deeper Self of all being, all reality, all life, all consciousness. Perhaps this is what Shapiro is referring to when he says that there is no ultimate dissolution of “self,” your sense of “self” is not erased. The “self” is transformed, transfigured, irrevocably changed to recognize or realize itself as an inseparable part of a much greater process, a manifestation of a much greater Being, an emanation of a much greater Reality. And it realizes it is never separate from this greater Reality, this greater Truth, but is a result of It, found wholly within It, as It’s very expression. The individual sense of “self” is transcended to a much greater sense of Self, the Absolute, which includes all beings, and Reality itself. Some refer to this as God, YHWH, Brahman, Buddha-nature or Dharmakaya, etc. The self is realized as One in God, no longer separate from God, but One in the Whole Self, the Divine Self, the collective Self, the true Self. Depending on how we look at it then, the sense of an individual separate “self” has indeed dissolved, or passed away, both in the direct mystical experience of God wherein one experiences only God and their separate ego “self” has become nothing (there can be no “separate” anything in God, since God is One), and in how one’s sense of self is radically changed through that experience. There is still a self after the experience. The “old creature” has “died” in consciousness in a very real way, and a new sense of Self has been born, has taken its place, no longer feeling strictly separate, but knowing its deeper Oneness with and in All. It may still be an ego-self, but it tends to become transparent to the true Self, or reflective of the true Self, the Divine Nature. Next postDoes Language Construct Reality, or our Perception of Reality?